Some time after Charlie Sparks sold this show he purchased from Andrew Downie, a motorized show (Downie Bros. 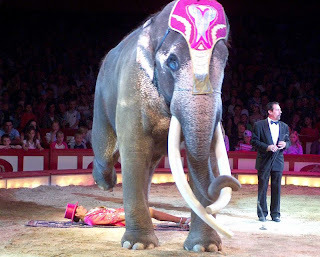 Circus) and included in the elephant herd was a beautiful young tusker named "Teddy". 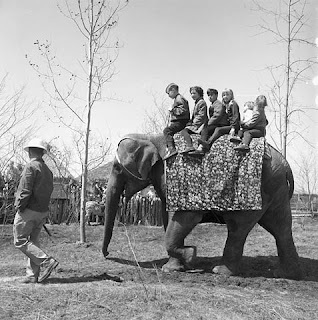 My father, in an endless effort to own his elephant, contacted Mr. Sparks when he heard that "Teddy" was becoming more difficuilt to manage and I have the letter of reply which was very cordial but nothing came of this. I also have a letter from Jerry Mugivan in response to my dad's effort to buy "Young Snyder". Also a letter from Zack Terrell to whom the matter was referred to since he managed the Sells-Floto Circus that "Snyder" was a part of. Early Blog this morning since Ben and I have to pick up Dalilah's U-Hall truck at 7:30 for the final day of furniture moving. As were all circus baggage horses, they rode in the stock cars wearing their harnesses so the moment they were unloaded they could begin to unload the train. However as soon as the show was spotted on the lot, they were fed, washed, groomed and had the rest of the day to sleep until it was time to start taking wagons back to the train at night. Writing on the back says, "Sparks Circus, Ithica, N.Y. May 24th 1916". You may notice that some of the wagons are riding the flat cars crosswise. These were usually cages since they would be light enough for the train crew to man handle them around into position. Incredibly, everyone stops to have their picture taken in this 1916 shot. Three men on the wagon pole, must be a pretty good load. I don't know if this shot of the Advance Car was taken at the Macon Fairgrounds or during the show's final years when they wintered at the Ringling Quarters in Sarasota. Some work being done on the elephant car. The largest herd the show ever had was nine, 1927 thru 1931. An interesting picture. I would suggest that the train has stopped, while making a Sunday Run, long enough for the working men to pick up their dukie bags at the pie car. Some are seated on the tracks enjoying their repast. In the foreground we see the management looking on, in fact the man in the vest looks to me like Ira Watts. Someone wrote on the back, "Sparks Show pulling out of Sarasota for the last time, April 30, 1931." Some photos of young joseph ashton circus now in western australia, great young australian circus also a photo of the oldest circus names in australian circus left to right jules bullen great animal trainer, doug ashton now 88 (doyen of australian circus ) and robert perry. 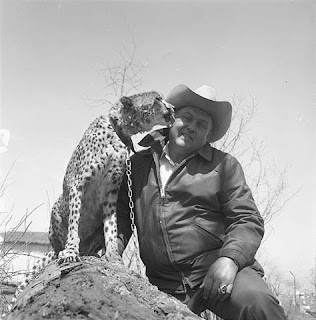 Buckles: Picture is of Gene Holter and cheetah named Tarzan. Taken at Expo67 in Montreal. Thought maybe some of your readers would enjoy putting a face to a name that appears every now and then. Gene was certainly one of the great characters in the business. 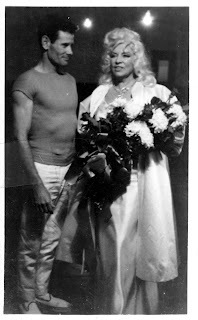 Buckles: Another Expo67 photo this of Winkie and me. I believe she came from the Brookfield Zoo, and may have been trained by Smokey (not sure). She was sold to International Animal Exchange and was sent to a park in Japan. At expo we started elephant and camel rides at 09:00 and finished around 10:00 pm. Sharp eyed readers will note in the background one of Gene's hand painted "Zebras" take a white mule, clip tail and mane add a little hair dye and away you go. Maybe Henry has told you about this site, if not here it is.www.fotocommunity.de/pc/pc/cat/3648Attached is a sample. 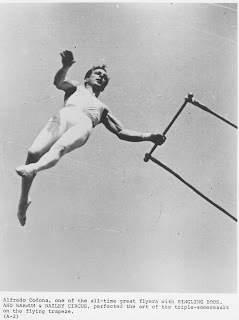 & rena.i have written a book about the perry family from when they started in about late 1800s and my 51 years in the circus. 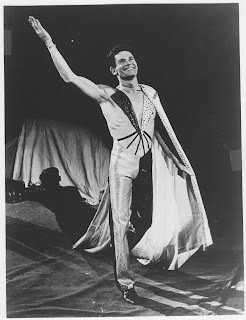 mark anthony the us clown gave me my first uni-cycle when he was with wirths here in australia back in the 1950s can you tell me how i have to sighn in to your great web blog.